The 23rd of April is St. George’s Day here in England. 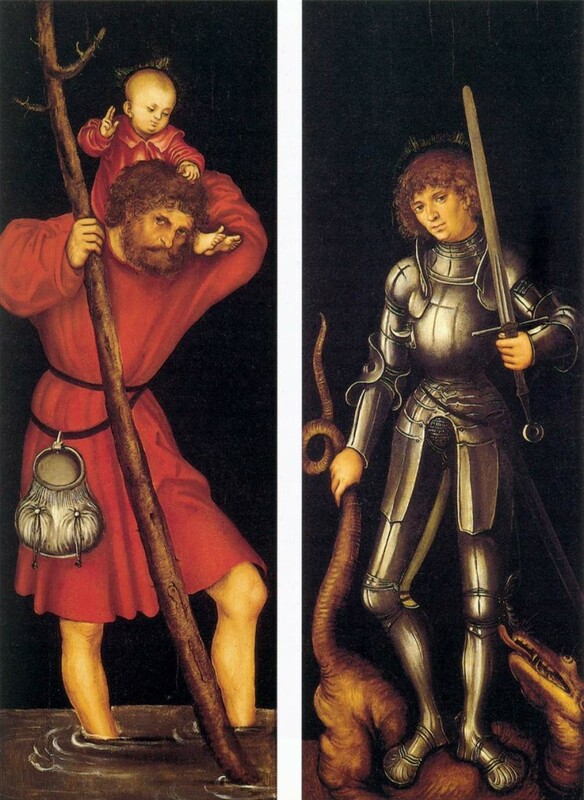 There is something inherently romantic in the many artistic depictions of St. George. 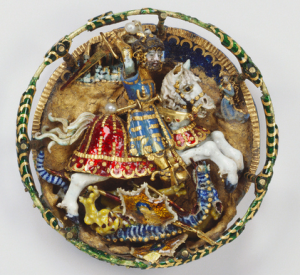 He is often in full armour, brandishing a weapon, and on the verge of killing a dragon. 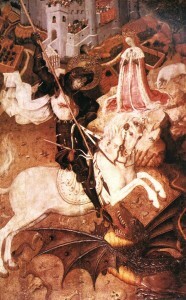 Later on in this post, I hope to convey the importance of St. George in the history of England and of Britain itself. That doesn’t sound so good, does it? Today’s Google Doodle in honour of St. George’s Day! George was born in Syria to a Greek family. He served in the army of an Italian city-state and ultimately died living in Turkey. His parents, though Greek-speaking, were born in Cappadocia in central Turkey and Palestine respectively. Do people fail to understand that modern countries such as Italy, Turkey, and Palestine didn’t exist as we now know them? For one thing, he was born in the Roman Empire Province of Syria-Palaestina, which was a unification of the lands of Roman Judaea and Roman Syria. Also, why is there such emphasis placed on his being “Middle Eastern”? What, and Jesus wasn’t? Does it even matter? As the excellent historian, Ian Mortimer wrote, “Clearly, it does not matter where a saint came from. It is what he stands for – the message of his life – which is important. In all the cases above, St George stands out as unique in one respect. His message has absolutely nothing to do with converting people to Christianity. St George stands for the courage to face adversity in order to defend the innocent. The triumph of good over evil, through courage.” You can read more of Mortimer’s article on George here. Exactly. 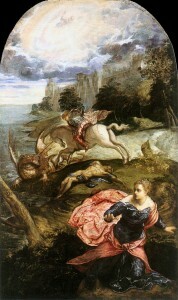 Regardless of his origins, there has been an attraction to this saint’s story throughout history, and the story about his defeating a dragon (which represents Satan). Let us have a look at some more beautiful paintings that were inspired by him. I think some of the finest works depicting George came from the 1400s on. Gallerie dell’Accademia, Venice. Web gallery of art. According to Ann. Mon. (Rolls Ser. ), iv, 10., the chapel of St. George’s was erected by Robert d’Oilly I in 1074 within the castle of Oxford. That’s one of the first references to buildings named after him in England. In 1475, King Edward IV commissioned the building of St. George’s Chapel, at Windsor Castle. To this day, the Chapel is an incredibly beautiful Christian site. 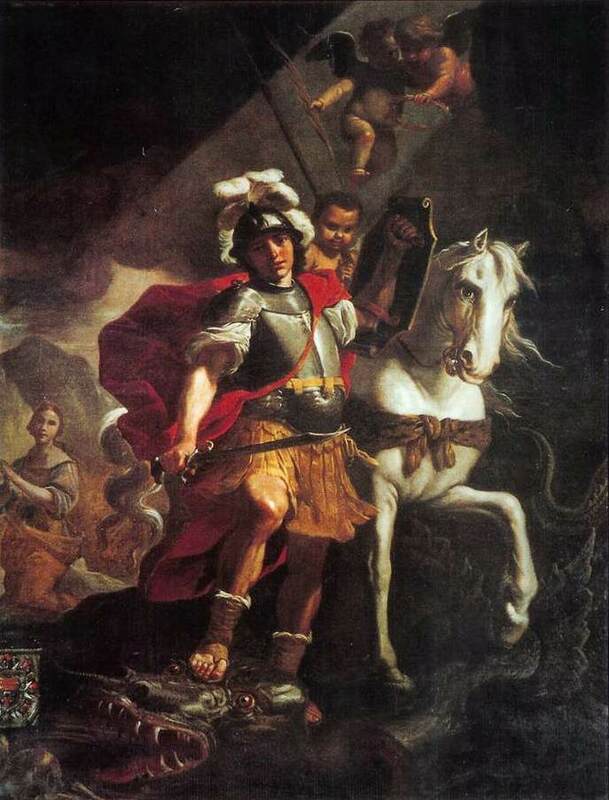 The Tudors, experts in the art of propaganda, also used St. George to their advantage. Most of them, with the exception of King Edward VI (who was sceptical about the saint), incorporated something to do with St. George. Elizabeth I had a talent for making herself into a symbolically powerful monarch. 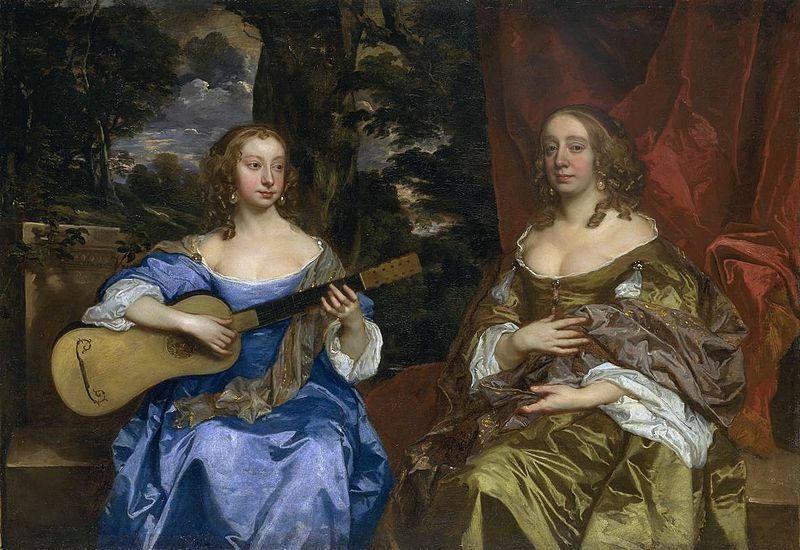 She often had references to her purity and virginity in her portraits. ‘Cry God for Harry, England, and Saint George!’ – Henry V, Act III, 1598. As for the Stuarts of the 17th and 18th-centuries, they too recognised St. George’s importance. It is no coincidence that three Late Stuart monarchs chose to have their coronations on the 23rd of April – St. George’s Day. Was the coronation of His Majesty Charles the Second in the Abby-Church of Westminster at all which ceremonie I was present. 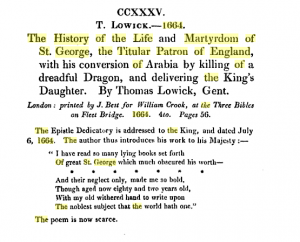 In 1664, Thomas Lowick published a History of the Life & Martyrdom of St George, the Titular Patron of England, which unfortunately I cannot find to include here but for the image on the left. Following Charles’s death in 1685, his brother James became King James II. Again, on St. George’s Day, James chose to be crowned. Evelyn still writes about this coronation, although he himself did not attend because he did not wish to leave his poorly wife on her own. Let’s see his post for that day anyway, 23rd April, 1685. Collegiate Basilica of St. George, Gozo, Malta, via the Web Gallery of Art. What tends to be even more controversial is the English flag itself. 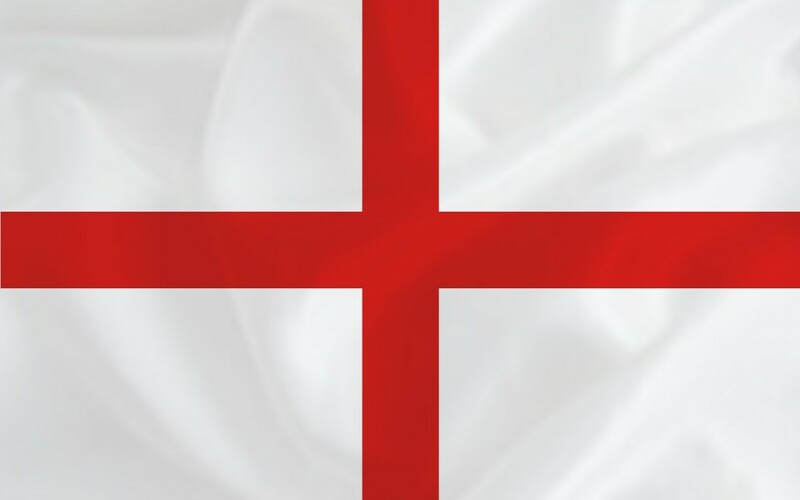 Only in very recent times (less than fifty years), the flag of St. George has been mainly associated with football or, by some, as a symbol of racism and imperialism. Yes, there is a red cross on the flag, but honestly, this country has a very long history of Christianity, so it shouldn’t be shocking. Yes, it seems to have been first used during the Crusades, but that’s also part of this nation’s history. St. George is the patron saint of England and he is worshipped in several places throughout the world. Personally, I am tired of being warned by people to take down my flag because it will be offensive to immigrants. I am an immigrant and I chose to live in this country because I love it, respect it, and do not wish to change it. As a cultural anthropologist as well as a historian, I see no reason why the English people should be told they have no right to celebrate their heritage and culture. Why should Scottish people be congratulated for being proud of their heritage when English people are vilified for doing the same? It is nonsensical. Every single culture I have studied throughout the world has had good and bad elements and have helped and have exploited. Not a single culture, not a single group of people in history has been beyond fault. I’ve covered a little bit of the history of St. George, and you can see that over the past several hundred years, he has been an important figure to the nation. Why should that change? Why should we not celebrate St. George’s Day? I love celebrating national holidays – I enjoy St. Patrick’s Day, although I’m not Irish, I was in Paris once for Bastille Day, the 4th of JuIy (USA), etc. I’d love to participate in national holidays throughout the world because it would be so great to see people showing a love of their tradition and culture. Such days bring people together in a wonderful way (and not just by going down the pub, either). And so on this day we call St. George’s Day, I want everyone who wants to display the flag to be able to do so without shame. thank you, Andrea! Well stated.’ Cry God, for Harry, England, and St. George’! I am English, Irish, Scots and Breton/French, and a US citizen. Also a cultural anthropologist. I believe in celebrating the good in all cultures. Great article; I learnt a lot. And I had a lot to think on. One of the things I thought about was about a man that lives in a little old cottage at the side of the road on the way to work. He has a flagpole in his garden and, every day, he raises a flag relating to a country for which the day has an importance. I once wrote to him, to tell him how much I appreciated his efforts of raising a different worldly flags every day. His answer was so sweet. He was delighted to hear that it cheered me. He had a chest of flags which he used to celebrate with other countries around the world. He wanted to share that with others. On the way home today, I didn’t see St George’s flag. I hope everything’s ok. Surely the classic design on the gold Sovereign and silver Crown coins deserve a mention?